Long before anyone had dreamed up Netflix, two seminal documentaries from legendary filmmaker Bruce Brown were being passed down like a rite of passage through the generations. One was the original surf classic The Endless Summer and for the motorcycle mad it was, On Any Sunday. 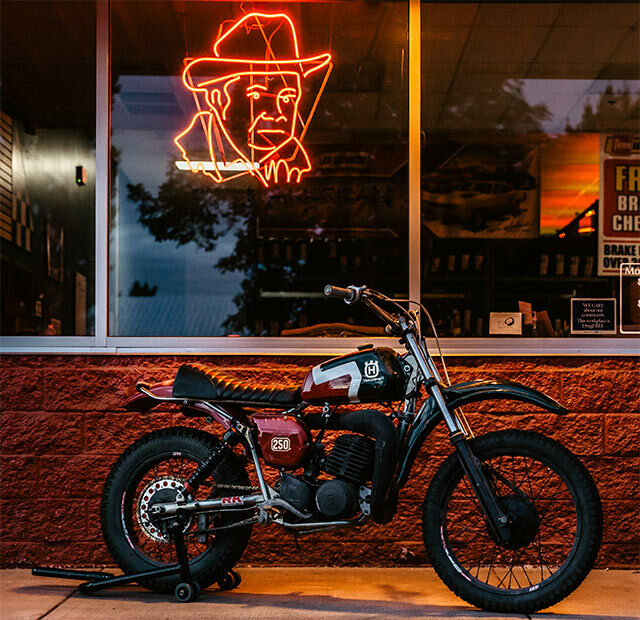 For photographer Anthony Scott the movie that injected fuel into our veins had him as a child tearing across the open fields of Alabama racing his brother on their BMX bikes. 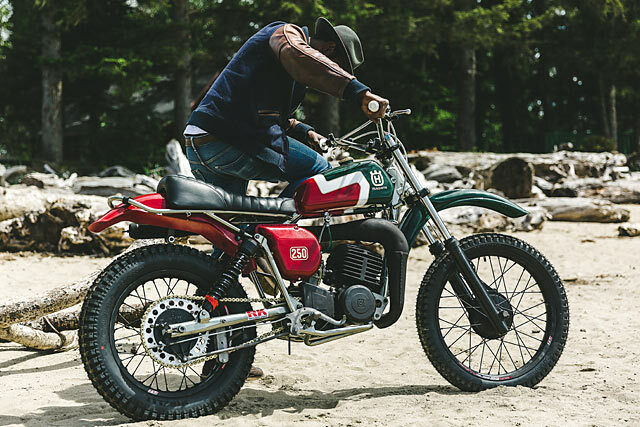 Decades later the man behind Enginethusiast and the newly formed The Revival House in Oregon decided it was time to make those childhood memories in adult scale. 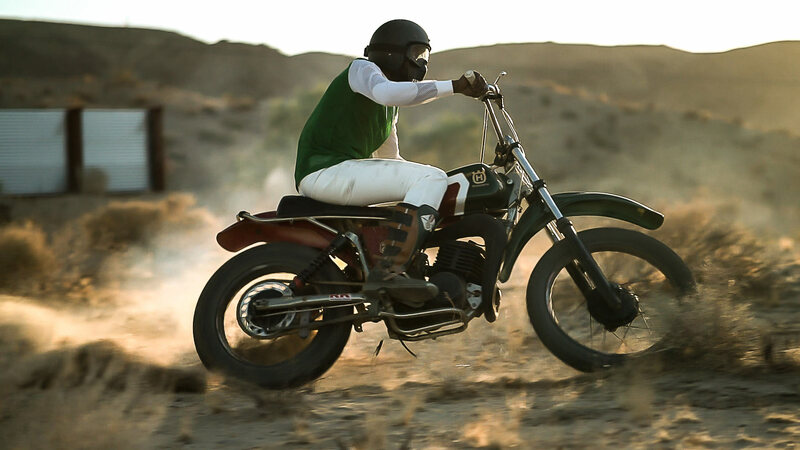 Built to race the desert sands it’s his Engine #23, a 1978 Husqvarna 250WR with that Steven McQueen smile. Always looking for new ways to do things around anything and everything automotive, Anthony created The Revival House with a group of friends. “A few people have asked me what The Revival House is, and to be honest we will let everyone know when we know what it is. 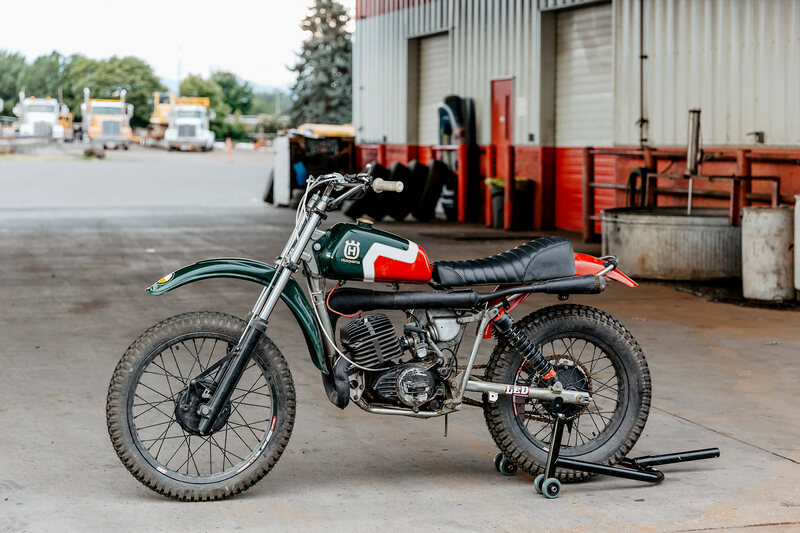 At this point, just consider us your friends in Portland, Oregon that you may run into with a camera and a passion for all things engine,” beams the Enginethusiast himself. 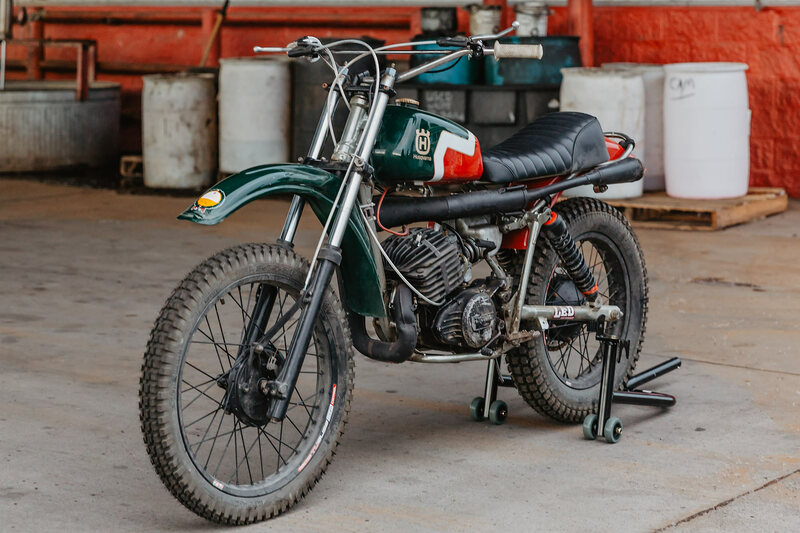 And in the ’78 Husqvarna he has himself an engine that was still dominating Enduro racing among the emergence of the Japanese 2-strokes and the converted road going British twins, the Husky had the perfect mix of power, lightweight and reliability. 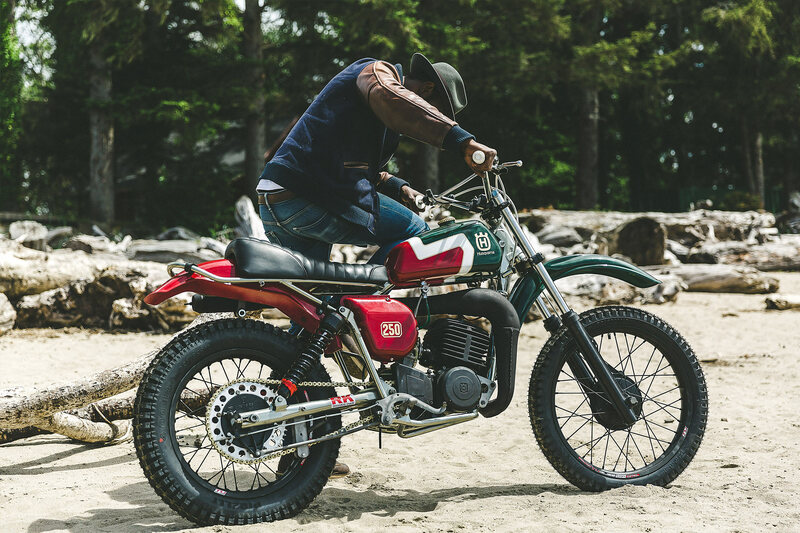 Its little surprise then that superstar Steve McQueen rode a 250 Husqvarna in that incredible beach scene from the documentary that inspired it all. Now at an age when he could swap the BMX for the real thing, Anthony was on the hunt for just such a bike. 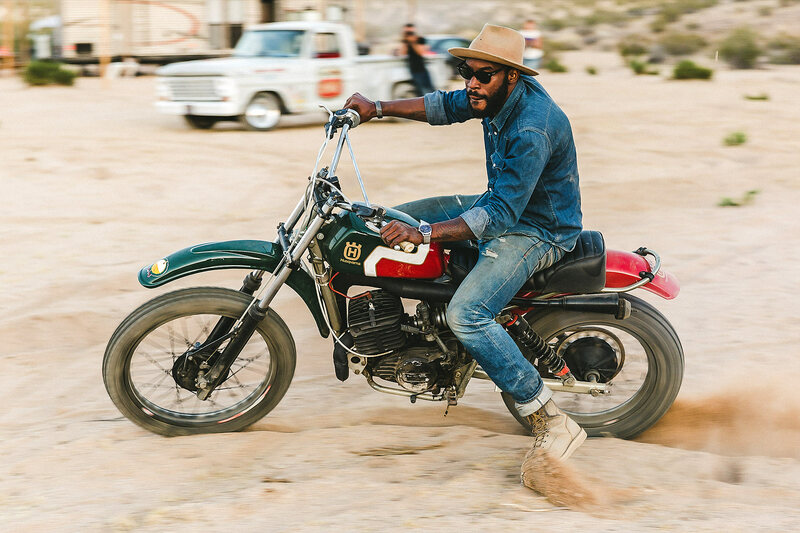 But it wasn’t just to fulfil a childhood dream, as The Revival House had an event planned down at Joshua Tree, California he explains. 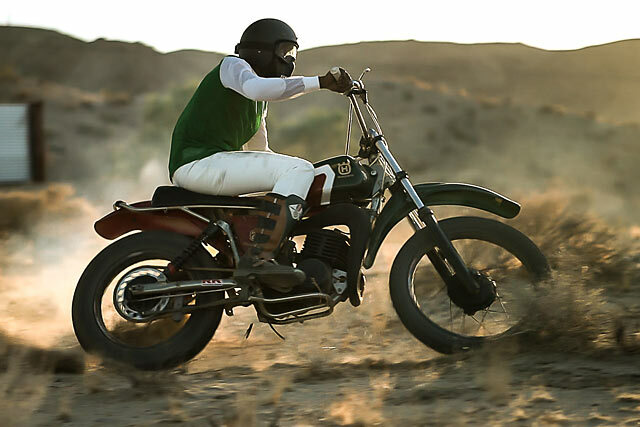 “The Desert Race was our first introduction of the Revival, focused on the glory days of a bygone era. We wanted to create an event that everyone could come out to and have a good time.” So the race would prove the first outing for Engine #23, but finding a donor bike isn’t so easy. 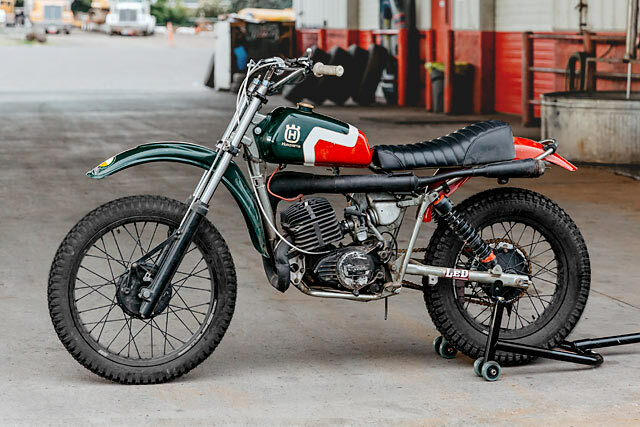 Steve McQueen’s own Husky that he used to tackle the Mojave Desert was recently sold for $100k and while other examples aren’t so pricey, they don’t come cheap. 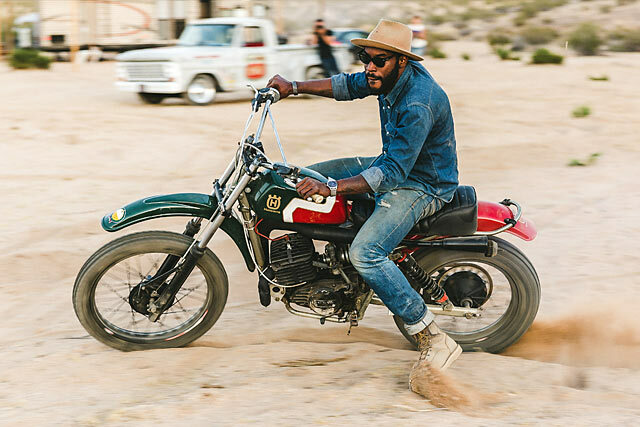 “I purchased the bike from Aaron Cope, who works as one of the bike builders for Icon 1000. 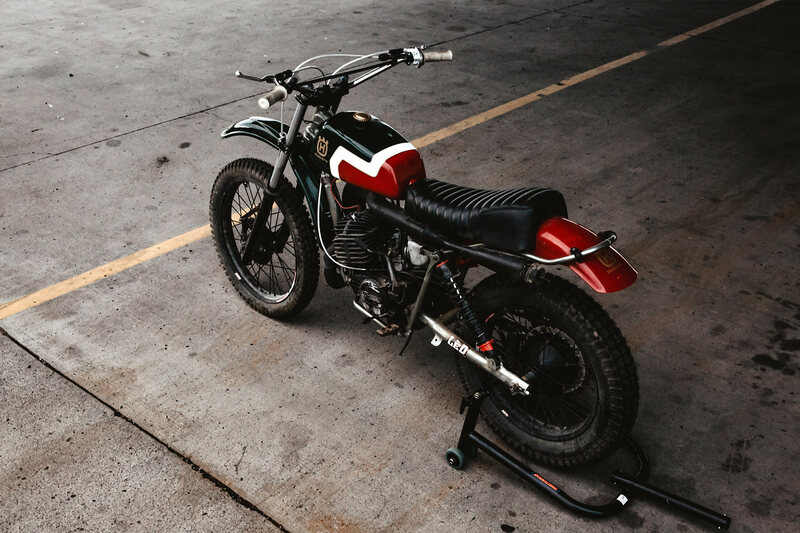 Originally when he told me about the motorcycle it was way beyond my budget, but almost 5 months later we worked out a deal and I was able to bring the old Husky home.” smiles Anthony. 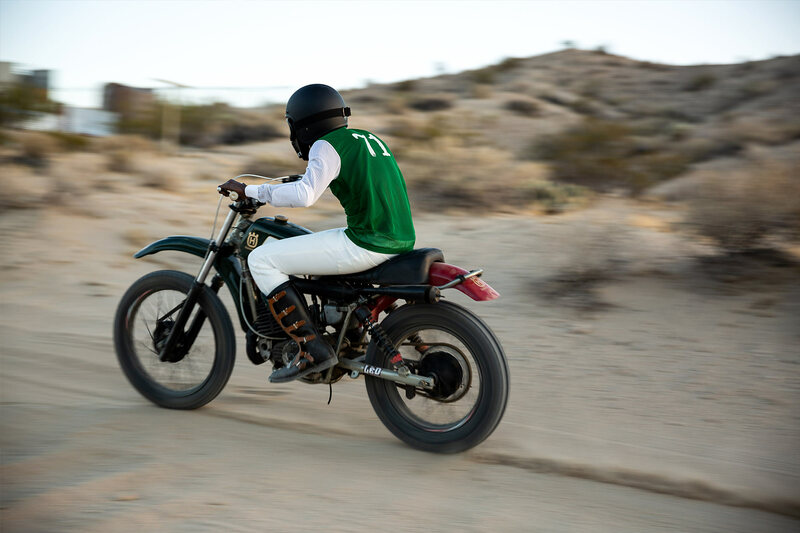 Now he could set about turning the bike into the perfect machine for racing in the California desert just like McQueen had done nearly 50 years earlier. 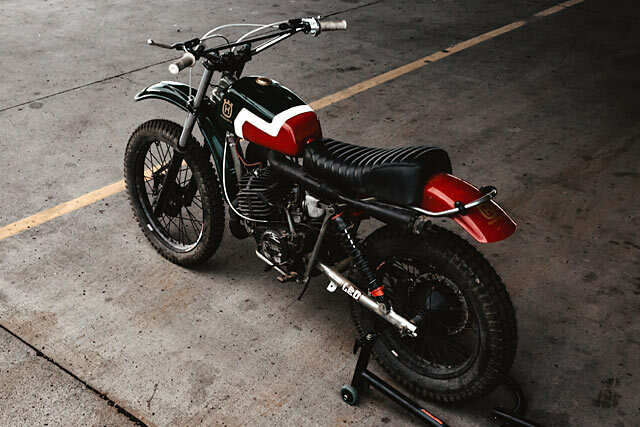 Wanting to keep the build process relatively straight forward and not lose the bikes classic charm it was the engine that would receive the bulk of the attention. “ I reached out to Arlan Lehman at LED Performance, pulled the motor out of the frame, and we promptly proceeded to tear it apart. As I was washing out some parts and cases in solvent water, Arlan yelled for to me to come over. 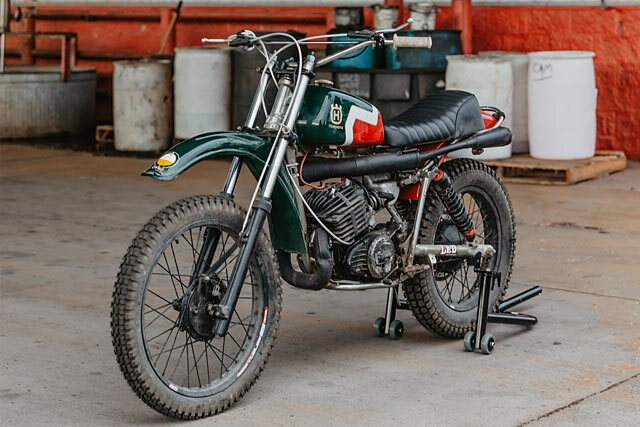 Low and behold we found that the cases had holes the size of quarters on one side that had been JB welded.” So under the watchful eye of Arlan, Anthony got to work piecing back together and rebuilding the 239cc air-cooled two-stroke engine. The rest of the build took place in the one spot any true biker will use when they’ve run out of space, “in my living room,” laughs Anthony. The frame was taken out for sandblasting to clean off decades of muck and all the nuts and bolts were given the vapour blast treatment. The Husqvarna was given new steering head bearings for a taste of the modern age while a new swingarm is bolted to the refurbished frame. Preparing it to handle whatever the desert could throw its way Anthony rebuilt the front forks and fitted up the short versions of the factory shocks. But there is always room to make a good bike look great and Anthony knew just the person to get it done with the time till the race closing in fast! 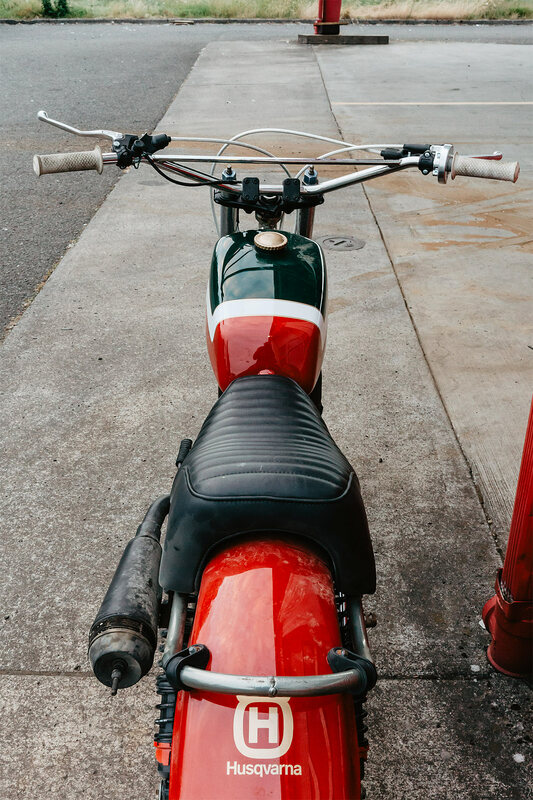 Despite the pressure, Lorin Holmes at PDX Paint Works knocked it out of the park with a custom job that takes nothing away from the classic ride. 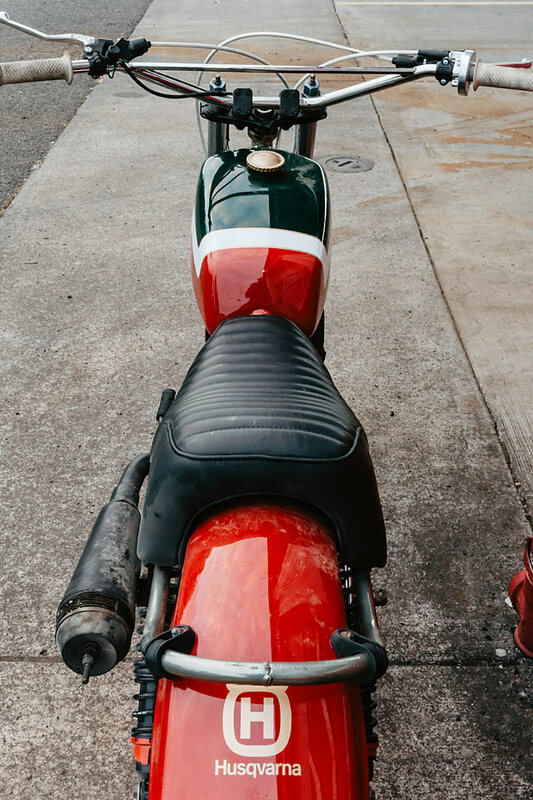 The big front fender and front half of the tank have been coated in a vintage dark green that is separated by a white graphic before the deep red flows rearward. Gold pin-striping breaks it all up with a gold gas cap and perfect Husqvarna logo completing the look. The period crosser bars with white grips provide the perfect pull back and with extra rise allow Anthony’s tall frame to fit the little two fiddy like a glove. 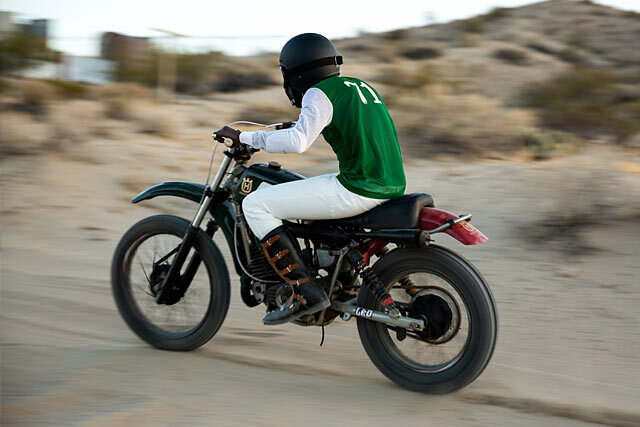 Racing flat-out through the desert you need your eyes glued to whats in front of you and a quick action throttle and levers mean there are no unnecessary distractions on the bars. New wheels provide the perfect combination of lightweight and strength and have been wrapped up in just the right rubber to dig into the sand and send it to the sky. With the finishing touch coming from Ginger McCabe at New Church Moto who always does a killer seat. But there was one final hurdle to overcome, working long hours, organising the race and trying to complete Engine #23 something had gone wrong. “After the motor rebuild was completed, I couldn’t get the transmission to shift even though it did on the bench no problem. This all happened with just one week to go before the event. Arlan knew I couldn’t take off any more time from work, so in turn he did us a huge solid by rebuilding the motor again and correcting the transmission issue. He saved the day!” recalls a very relieved Anthony and the result of their combined efforts are for all to see. 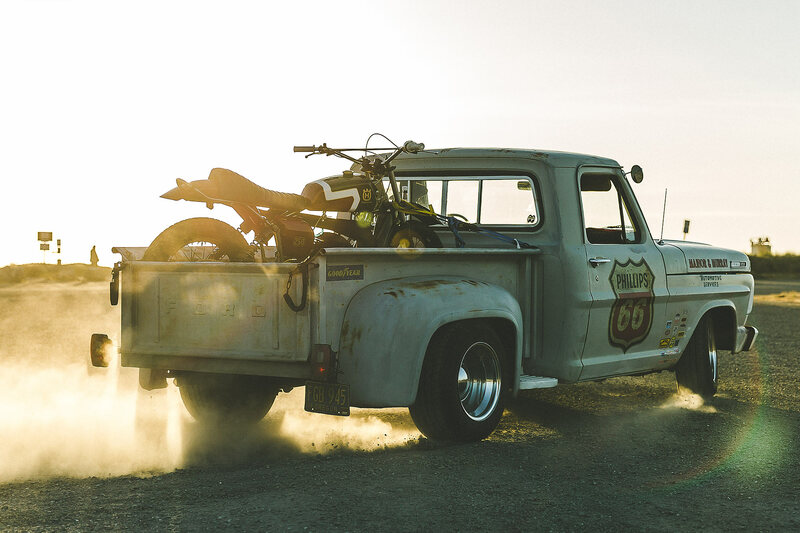 So whether it’s at The Desert Race or somewhere in Oregon, on any Sunday you’ll find Anthony blasting two-stroke Husky smoke having made those childhood memories a real life dream!